There was no Foodie Friday last week. There will be no Foodie Friday this week. Why? Because we had last week off work and between a minor renovation and Hallowe’en, our eating habits have been atrocious. That said, I have pictures to show! Our home is a constant work-in-progress. I’m sure that if you ask most homeowners, they would agree that you’re never really finished attempting to find ways to find a place for the sheer amount of stuff that you tend to accumulate – without sacrificing the sense of personality in your home. Our living room was a cluttered mess. I would suspect that unless one has a particularly handy spouse, most people these days make do with whatever furniture they have, and for us that mean a lot of items that take up a good chunk of the floor space in our living room. The footprint of things like a sofa, recliner, digital piano and television added up and eventually took over the area off our kitchen. Being Canadian, we use metric. No, we are not Roughrider fans. That’s a magnet from a relative’s wedding. 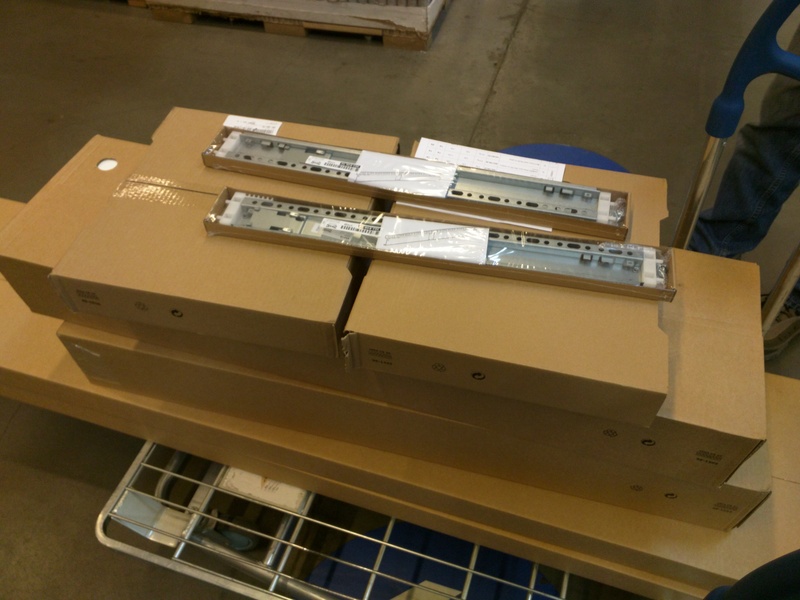 IKEA says to build up! Think Scandinavian! Luckily for us, we have someone in the family who does. My parents used to have a business designing, building and installing Systems 32 modular furniture — the same essential system that IKEA uses. 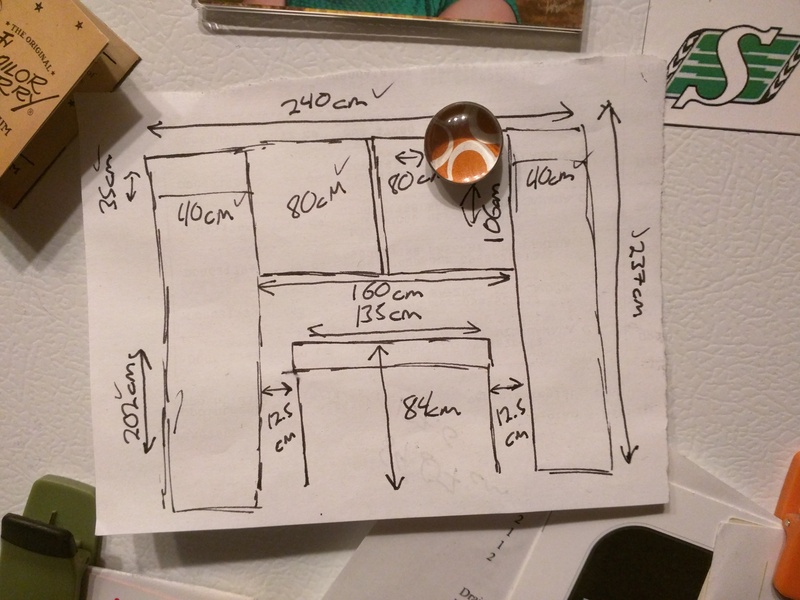 The Husbeast and I had tossed around some ideas for installing shelving in the living room, and Dad came on board as the project manager. Robin made measurements and drew up a plan, and the two men went off to IKEA with a shopping list for Billy book shelves. Then we set about the task of putting together a bunch of IKEA cabinets. The two middle shelving units were going to have to be suspended between two narrower, full units. To give stability to the structure, Dad took the two middle cabinets back to his shop and made some modifications. 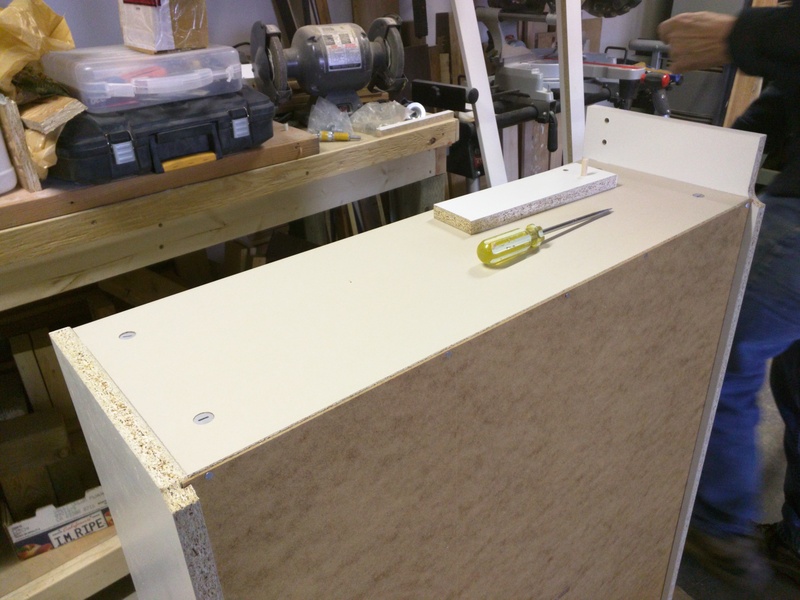 The goal was to create a shallow box that would span the length of both cabinets and take the place of the kickplate. In addition to adding a stable anchor point when attaching it to the wall, it would also be a nice, finished edge that, frankly, didn’t look like we’d stuck a couple of floor cabinets on a wall. Back at our place, we cleared room in the kitchen and assisted Dad in assembling the pieces — upside down. The top edge was going to be the one place where everything lined up. The one wall that we could use for this build has a few…quirks. We had to compensate for a motion sensor, light switch, and a cold-air return. A Dremel is a very useful tool. In this case, it was used to widen the area around the cold-air return and sink the cover farther back into the wall. We needed the cabinets to be as flush with the wall as possible for that built-in effect. Casing needs to be flush with the wall. Dremel Time! 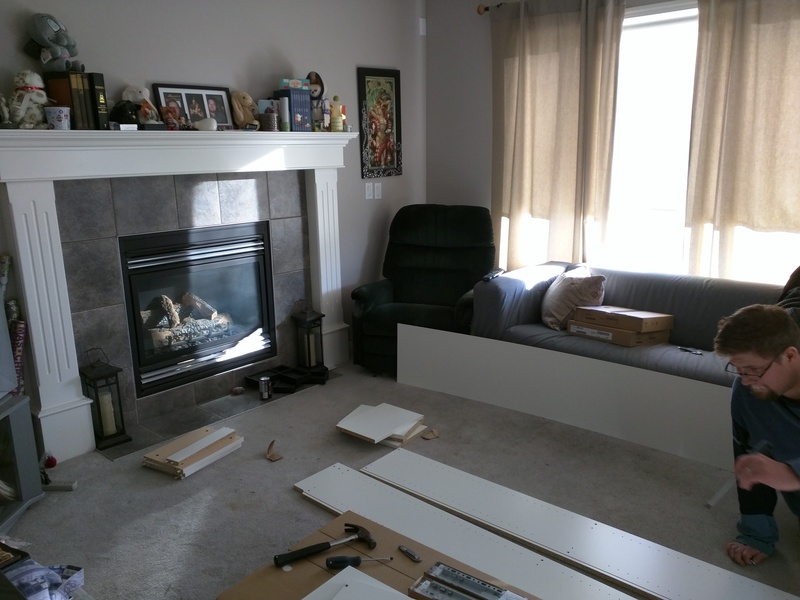 Once the cabinets were bolted together, we slid it into the living room on towels and flipped it. This is not a hard task when there are three of you. You just need someone to keep track of where all the low-hanging lighting fixtures are placed. Notice the cold-air return? We had to make another modification to the cabinet for it. Ever notice how, when someone has to climb a step-stool, there’s a cat that needs to wave her tail right in the path of the person’s descent? Yeah, we noticed it too. Finally, we dremelled out the areas for the motion sensor and the light switch. For the short term, they’ll be hidden behind books. Eventually we’ll finish those edges. The main thing is that they’re accessible and in working order. Almost done…now that we’re flush to the wall, with access to electricals, we drilled into the studs from the aforementioned box that was attached to the bottom of the central shelving units. We knew we wouldn’t be able to bolt things in from the top of the bookcases, so this was an ideal anchor point. The piano fits perfectly underneath! There is still a little finishing work to do, including installing lighting, but we’re mostly done, for now. The addition of the shelves have reduced the clutter in our living room to an amazing degree. All my sheet music is in one place! Previously, I’d been storing a third in our kitchen shelving unit, a third in a Safeway carry-box, and a third tucked into the old TV stand. We have space to show off some of our nicer books, and an opportunity to display a few knick-knacks. Final thoughts? We now have room to rearrange and organize many of the books on shelves elsewhere in the house. There is even a thought of eventually building another shelving unit in the Husbeast’s office. 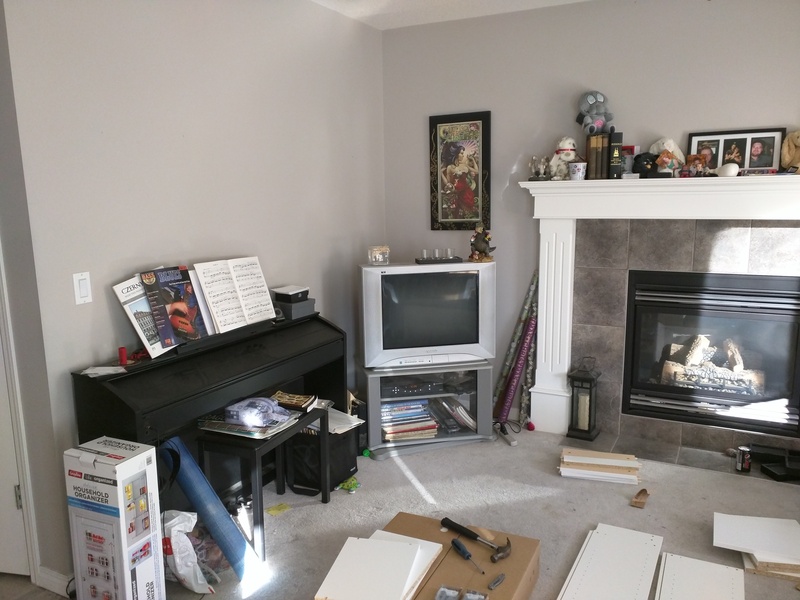 Our living room is now half-done, as we will be re-organizing furniture to take advantage of the fact that there is less “stuff” to deal with. The old TV has gone to electronics recycling, and its stand to Value Village. Eventually we will purchase a TV to install over the fireplace. The takeaway? If you know how to hack and stabilize IKEA furniture, you can build some wonderful storage solutions. A custom shelving unit like this would likely cost upwards of a thousand dollars. We think we spent just over $300. We were lucky, though, that we had a professional cabinetmaker in the family who was willing to work for the low, low price of dinner and conversation. Your own mileage may vary. And to think, this is only the start of our decluttering and organizing!